Pictures of different temples shared on Twitter as the yet-to-be built first Hindu temple in Abu Dhabi. 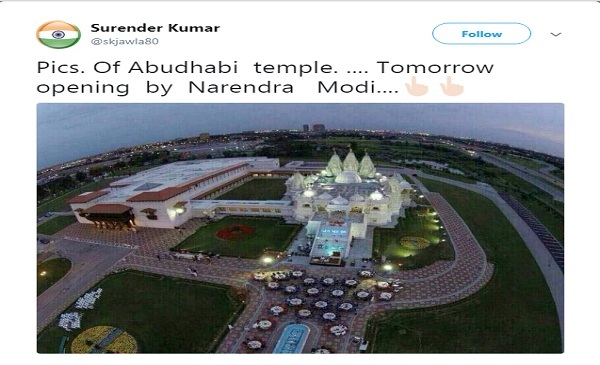 Four images of different temples are being shared as photos of Abu Dhabi’s yet-to-be constructed first Hindu temple that Prime Minister Narendra Modi will witness laying the foundation stone of, on February 11, 2018 via video conference. The pictures seem to have originated from WhatsApp and found their way to Twitter on Friday. 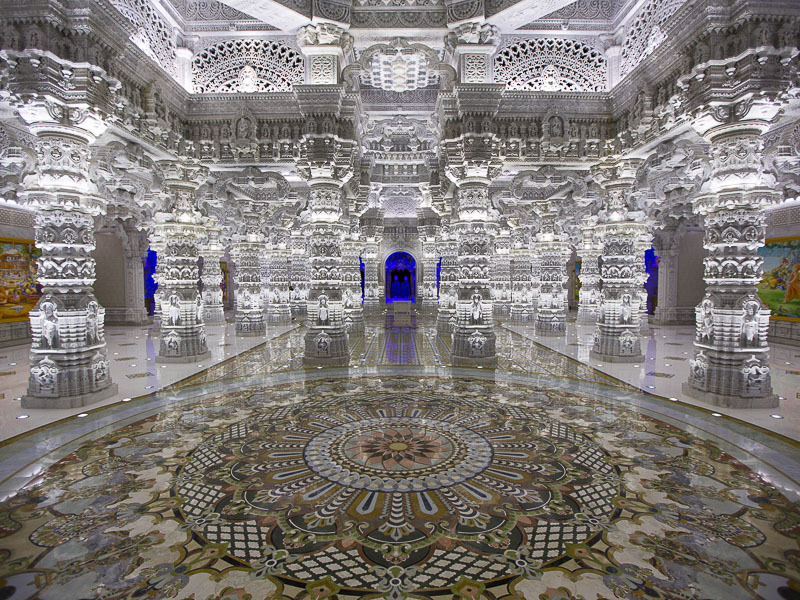 This new Hindu Temple in Abu Dhabi was allotted 25,000 square feet by The UAE Govt. Temple designs were approved when Modi first visited the UAE in 2015. 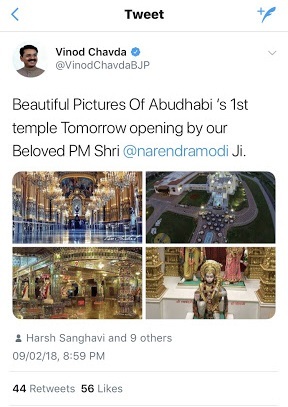 BJP MP Vinod Chavda also tweeted the pictures claiming it was a temple in Abu Dhabi that the prime minister would inaugurate. However, Chavda promptly deleted his tweet after Twitter users pointed out the mistake. BOOM reached out to Bochasanwasi Shri Akshar Purushottam Swaminarayan Sanstha (BAPS) which confirmed that the photos are not from the proposed temple in Abu Dhabi. “There are no photos of the temple in Abu Dhabi as there has been no construction as of date,” BAPS told BOOM in an email. 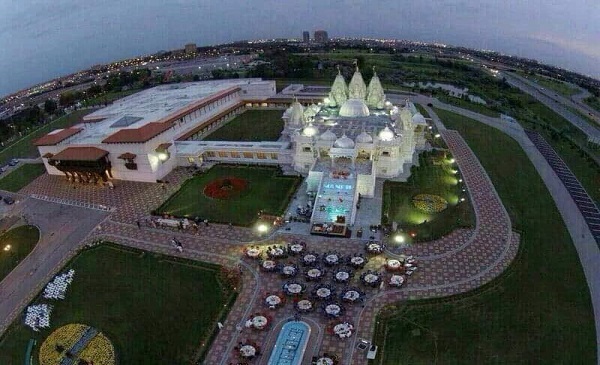 The organization clarified that the below picture is from a BAPS temple in Toronto. Another image from inside a temple is from the BAPS, Robbinsville in New Jersey. Prime Minister Narendra Modi is on a three-nation tour that began on February 9 with Palestine and will end on February 12. According news reports, the prime minister will witness the foundation stone being laid, from the Dubai Opera House via video conferencing. UAE granted land for the temple project after India expressed the demand of its nationals for a place of worship during the prime minister’s visit to the country in 2015, the Hindu reported. According to media reports, the temple, which is expected to be completed by 2020, will be built at Abu Mureikhah, off the Dubai-Abu Dhabi highway. It will be constructed incorporating all aspects of a traditional Hindu temple. The stones will be carved by temple artisans in India and will be assembled in the UAE. The complex will also include a visitors’ centre, prayer halls, exhibitions, learning areas, sports area for children, thematic gardens, and a food court. BAPS, a Hindu organisation, that has constructed temples in India and locations around the world, will manage the temple. The trust expressed gratitude to Shaikh Mohammad Bin Zayed Al Nahyan, Crown Prince of Abu Dhabi, for granting the land, in a statement on Friday. BAPS has major centres in Atlanta, Chicago, Houston, Nairobi, Mumbai, London, Los Angeles, Sydney, Toronto and New Jersey. The story has been updated with a response from BAPS.